« How did Dorje Shugden come into being? Dorje Shugden is an enlightened Being, an emanation of the Buddha of Wisdom, Manjushri, who arose as a Dharma Protector 350 years ago. He emanated as a Dharma Protector in order to best safeguard the precious teachings of the Second Buddha known as Lama Tsongkhapa, to benefit all sentient beings. During these degenerate times and due to our karma, Dorje Shugden is the most helpful Dharma Protector for us, because he is swift, powerful and benevolent. He removes our obstacles, protects us and our loved ones, and provides conducive conditions for a successful life and spiritual practice. Above all, he grants us our virtuous and spiritual wishes quickly. “Dorje” is defined as diamond – the hardest element which cannot be destroyed. In the Buddhist context, indestructibility refers to the fully enlightened mind. Dharma Protector practice is very valuable for helping to remove immediate worldly obstacles, problems and hindrances in our spiritual practice; and to provide conducive conditions for us to engage more effectively in our Dharma work and practice. There are two kinds of Dharma Protectors: Enlightened Protectors who are emanations of Buddhas, such as Palden Lhamo (an emanation of Tara), six-armed Mahakala (Avalokiteshvara), Dorje Shugden (Manjushri), and Setrap Chen (Amitabha). There are also unenlightened Dharma Protectors, such as Nechung, who may be spirits that were oath-bound by Lamas to stop causing harm and to serve and protect the Dharma as a Protector instead. We can take refuge in Enlightened Protectors but not in unenlightened Protectors. As emanations of the Wisdom Buddha, every incarnation that arose before Dorje Shugden manifested was a fully enlightened being. Each incarnation contributed greatly towards the growth of Dharma throughout the Buddhist world. Dorje Shugden’s lineage of incarnations includes past great Mahasiddhas (highly attained practitioners), renowned Buddhist scholars, monastics of high moral discipline and outstanding Dharma teachers. - Dorje Shugden is an emanation of Manjushri, the Buddha of Wisdom. 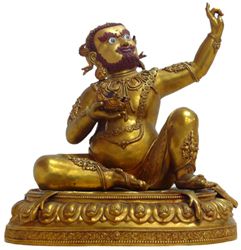 - Manjushri emanated during the time of Buddha Shakyamuni as one of Shakyamuni’s direct disciples. 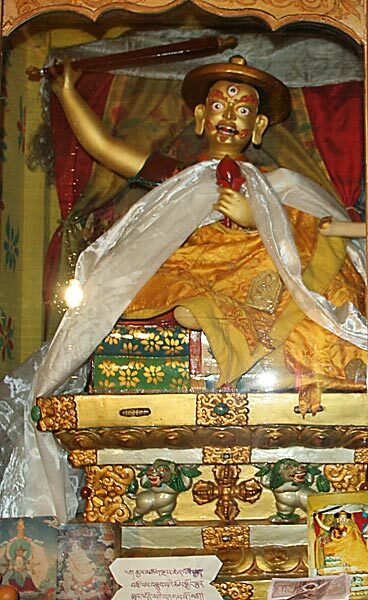 - Manjushri had already achieved full Enlightenment in a previous age, long before the time of Buddha Shakyamuni. 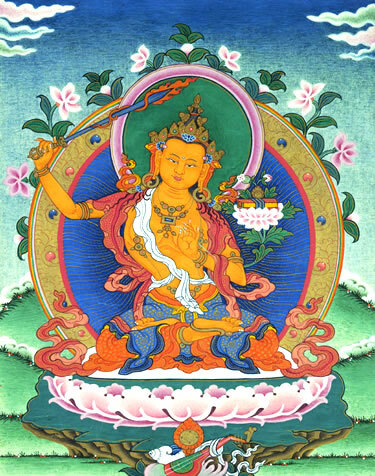 - In the Sutra Revealing the Abode of Manjushri, Buddha explains how Manjushri manifests countless emanations to help sentient beings. - During the day, he studied and meditated on the Sutra teachings and during the night he engaged in highly advanced practices. - Whenever he did his prayers, Buddhas like Vajrayogini and celestial beings with whom he had a particularly strong karmic connection would come to his room to participate in the ritual feast. - He was nicknamed “Birwapa”, which means “bad man” because the monks in Nalanda Monastery where Birwapa studied saw the celestial beings in his room as ordinary women and believed that he was breaking his ordination vows and bringing bad reputation to the monastery. - Due to Birwapa’s extraordinary deeds, many people developed faith in him and in the Buddhist teachings. In this way, he led many people onto a spiritual path. 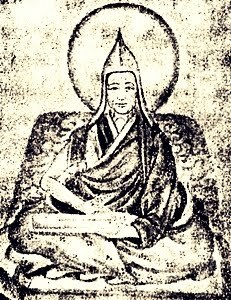 - Birwapa later incarnated in western Tibet as the great Lama of the Sakya Tradition, Sachen Kunga Gyeltsen, more commonly known as Sakya Pandita. - He was very special even as a young child. Once, he dreamt that the great Indian Pandit Vasubandhu gave him teachings on his text Treasury of Phenomenology. When he awoke, he had memorized the entire text, which was almost 50 pages long. - Sakya Pandita’s name spread far and wide, reaching even to the Chinese Emperor who developed deep faith in him and the Buddhadharma. 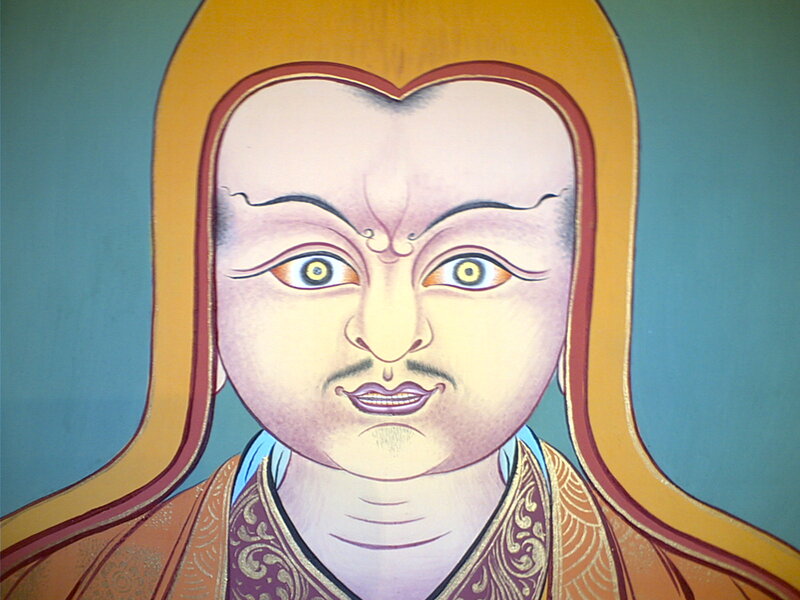 - Sakya Pandita took rebirth as Butön Rinchen Drub in western Tibet. When Butön was a child, he could converse with Manjushri and displayed attainment of compassion and Bodhicitta in his speech and action. Sakya Pandita and Butön Rinchen Drub showed practitioners how to meditate correctly and practice effectively to develop great wisdom and concentration. - Butön Rinchen Drub was later reborn in central Tibet as Duldzin Drakpa Gyeltsen, who became one of Lama Tsongkhapa’s principal disciples. - Duldzin Drakpa Gyaltsen’s main activity was to help the teachings of Lama Tsongkhapa to flourish. - He was especially famed for his pure morality and for upholding his vows very purely. His very name, “Duldzin”, means “Holder of the Vinaya”. - Duldzin Drakpa Gyeltsen oversaw the full building of Gaden Monastery, the first and most prominent monastery of the Gelugpa school of Buddhism. 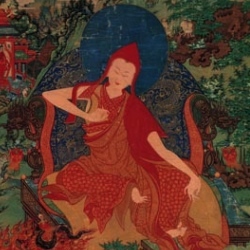 - Lama Tsongkhapa’s disciples believed that Duldzin Drakpa Gyeltsen and Lama Tsongkhapa were equal in terms of their realizations, abilities, and wisdom. The position of Gaden Tripa – representing Tsongkhapa on earth, after his passing – was offered first to Duldzin. However, Duldzin declined the honour and offered it to Gyaltsab Je, choosing instead to devote his life to protecting and spreading Lama Tsongkhapa’s teachings. - It was with this commitment and devotion to the Dharma that Duldzin first made a promise to arise as a Dharma Protector specially to protect the Middle view of Nagarjuna, as taught by Lama Tsongkhapa. -	Duldzin Drakpa Gyeltsen was later reborn in central Tibet as the special Lama Panchen Sonam Drakpa. Like Duldzin, he devoted his whole life to make Lama Tsongkhapa’s lineage and teachings flourish everywhere. - He was the Spiritual Guide to the 3rd Dalai Lama. 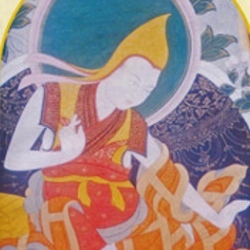 -	This Lama was unique in that he was the only person who has ever become the abbot of all three main Gelug monasteries – Gaden, Sera and Drepung in a single lifetime. He was also the Abbot of Gyuto Tantric College and became the 15th Gaden Tripa. -	Panchen Sonam Drakpa wrote many commentaries to both Sutra and Tantra. To this day at Drepung Loseling, the largest Gelugpa monastery, as well as at Gaden Shartse, monks qualify for their Geshe degrees by relying principally upon the scriptures of this great teacher. 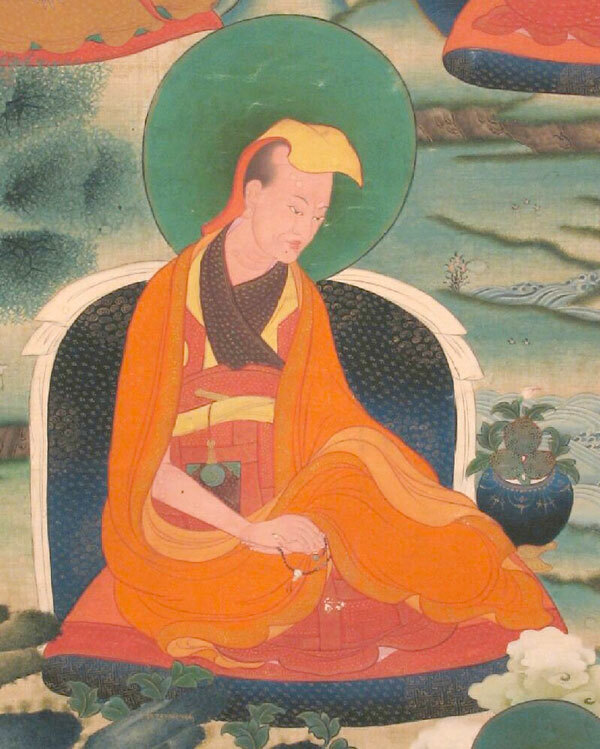 - Tulku Drakpa Gyeltsen lived in Drepung Monastery during the time of the 5th Dalai Lama. They were both disciples of the First Panchen Lama, Losang Chokyi Gyeltsen. Their affinity went back to the time when Tulku Drakpa Gyeltsen – in his previous incarnation as Panchen Sonam Drakpa was the Spiritual Guide to the 3rd Dalai Lama. - Tulku Drakpa Gyeltsen was so highly attained that Tibetan, Mongolian and Chinese nobility and royalty would travel immense distances just to make offerings and request teachings from him. His attainments were often likened to those of the Dalai Lama himself. It was in this lifetime that Tulku Drakpa Gyeltsen fulfilled his promise to become a Dharma Protector and arose as Dorje Shugden. This entry was posted on Thursday, July 30th, 2009 at 4:54 am	and is filed under Starter Kit. You can follow any responses to this entry through the RSS 2.0 feed. You can leave a response, or trackback from your own site. Oh how I wish I could be born and immediately be able to converse with Manjushri like Butön Rinchen Drub did! I think that for those who find it hard to accept the legitimacy of Dorje Shugden being an enlightened being, this page would clarify a lot of doubts. For those who were part of designing, writing and compiling this…thank you I shall forward it on to the Facebook page! Thank you to all those who spent countless hours getting this info up.It is well designed and with clearly presented information which will be so useful for newbies who sincerely want to practice Dorje Shugden to help them clear the doubts that they have regarding the controversy. Thank you so much for sharing this precious information, making the site so beautiful to look at, and accessible for someone like me who has limited concentration for written material. (I listen better). I long for tranquil abiding, and this helps. I have many inner obstacles; now I have more help. Much gratitude for your virtuous actions that help me and other sentient beings. I love this starter kit. I have emailed the link to a few friends and they find it very easy to grasp and interesting. Some of them even downloaded the prayers and have started getting to know Dorje Shugden. Thank you for helping others connect with this wonderful Dharma Protector. This starter kit on the Dorje Shugden lineage is very useful. The information is given in a concise and precise manner which makes it easy to remember the facts. The pictures of the incarnations also help us to make a connection with these holy beings. I must say this starter kit is absolutely fantastic. It’s PERFECT to use this starter kit to educate friends on Dorje Shudgen. I’m going to transfer this into a power point and word doc to start some of my friends on this holy practise. It will benefit them. THIS IS THE BEST DORJE SHUGDEN SITE IN THE WORLD. NEWS, ILLUSTRATIONS, FORUM, ARTICLES, VIDEOS, PICTURE GALLERY, BROCHURES, GUESTBOOK, AND A PLACE TO CONGREGRATE FOR ALL THOSE ENDURING THE BAN WITH SO MUCH STRENGTH. THIS SITE SERVES TO EDUCATE, EMPOWER AND OFFER SOLACE. FANTASTIC SACRED SPACE WE HAVE HERE.